Hacker GeoHot is known for jumping around various hacking scenes. He first started off working with iOS releasing numerous Jailbreaks, then transitioned into hacking the PlayStation and now it looks like he is getting into creating Android roots. 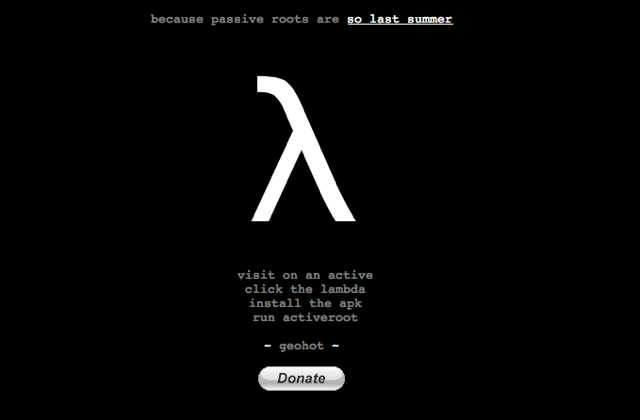 According to a thread on the XDA Developer Forums GeoHot has released a root as a single .apk file. Usually rooting is a little bit more complicated of a process compared to Jailbreaking, but with this ‘active’ root for the Galaxy S4 users simply need to install the .apk file and their device will become rooted. GeoHot is calling the tool ActiveRoot and it is available to download for free from the official ActiveRoot website. The steps for using ActiveRoot to root your Galaxy S4 are simple. Visit http://geohot.com/activeroot from your device and click the lampda picture to download the apk file. Run the apk. It should give you a message telling you that you have root. Visit the Play Store and download the Super User app of your choice (such as SuperSU). Let us know if you were able to use ActiveRoot to root your Galaxy S4 in the comments.